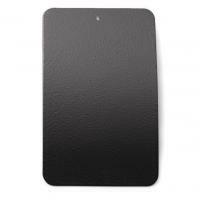 The 5" x 8" Hard Trauma Plate from GH Armor Systems is a dependable and economic way to provide officers with added chest protection. The rugged metal plates not only absorb blunt force shocks but also prevent lethal slashes, cuts and punctures. The plate's hardened exterior deflects knives, ice picks and blades of all kinds. Measuring five inches in height by eight inches wide, the trauma plate is designed to fit in vest pockets, uniform pouches and other tactical carriers. Because of their lightweight design, officers can wear these plated with compromising mobility or range of motion.